2017 was a BIG year in sports and you were there every step of the way! It’s that time of year where GSPN counts down the top stories of 2017. You’ve read, like, shared and tweeted about it and we’re bringing you the most talked about stories from the past year. 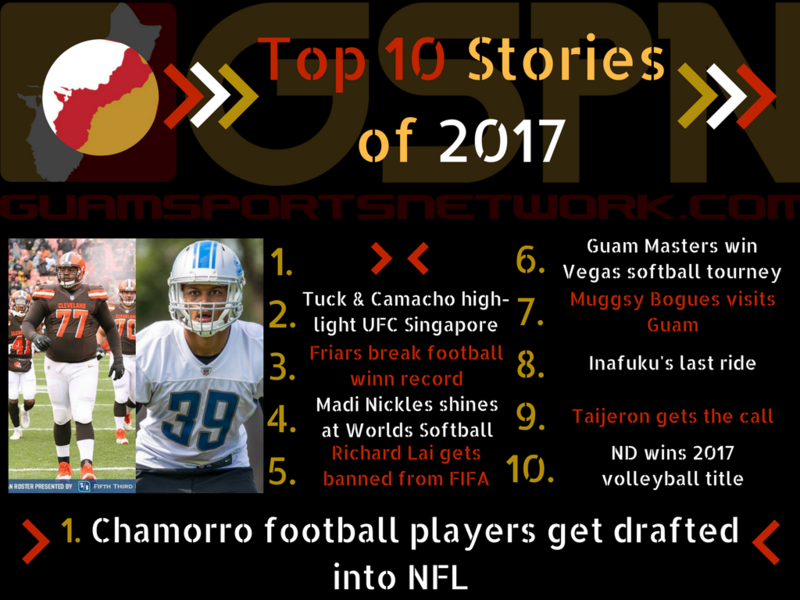 #1 – Zach Banner and Jamal Agnew get drafted: The 2017 NFL draft saw not one, but two Chamorro’s get selected by professional NFL teams in April! Zach Banner, who’s family lives on Guam, and Agnew, who’s family resides in Saipan, made headlines as the first Chamorro’s to get drafted since Steve Rivera back in 1976. Banner went as a 4th round pick to the Indianapolis Colts, but was later cut and then picked up by the Cleveland Browns. Agnew was a 5th round pick for the Detroit Lions where he would finish the year with two punt return touchdowns, one on Monday night! #2 – Tuck & Camacho highlight UFC Singapore: Guam’s Jon Tuck already made big news when he agreed to fight the legend Takanori ‘The Fireball Kid’ Gomi in UFC Singapore last June. That card got even more exciting for Guam and the Marianas as Frank ‘The Crank’ Camacho was called up to make his UFC debut. Tuck walked away from the biggest win of his career after stopping Gomi in the 1st round and Camacho left a good impression despite losing by decision. Camacho would later pick up his first UFC win over Damien Brown in November and both Tuck and Camacho are proudly representing Guam and the Marianas along the way. #3 – Friars break football win-streak record: The FD Friars not only broke the 26-game win streak record set by the 80’s GW Geckos, but they also brought in their third straight football title while amassing 30 straight wins, setting a new record. The 2017 season was all FD as they defeated their opponents by 30+ points every game, cruising into the playoffs where they ran rampant still en route to the 2017 title. How far will the Friars extend their winning streak in 2018? Most believe their reign has ended, everyone except the maroon and gold of course. #4 – Madi ‘Bubba’ Nickles outperforms best in the world: Chamorrita Madi ‘Bubba’ Nickles had an eventful 2017, making her debut as a UCLA Bruin, which was a lifelong dream of hers, and pouring out a performance like none other at the World Cup of Softball in Oklahoma. Nickles was awarded the Gatorade Softball Player of the Year in 2016 and she only proved why she was deserving of that award in just her first year of collegiate softball in 2017! #5 – Former GFA President Richard Lai gets banned from FIBA: In April, the Guam Futbol Association was hit with tragic news as former President Richard Lai pleaded guilty to bribery charges of over $1 Million dollars to sway FIFA and AFC decisions. His actions later forced a permanent ban from FIFA with GFA also selecting new leadership in Tino San Gil as President. #7 – Muggsy Bogues visits Guam: GSPN started 2017 with a bang, bringing NBA Legend Muggsy Bogues to Guam for the first time. Bogues’ visit was heard around the island as the shortest player in NBA history spent a week on Guam interacting with youth and expanding his basketball reach to the island. Bogues’ stated he would like to come back to Guam annually! #8 – Kevin Inafuku’s last ride: 2017 marked the end of an era for the Harvest Eagles as long-time volleyball coach Kevin Inafuku, and overall kick starter for the Eagles volleyball program, was set to embark on a mission of Faith. Knowing this would be Inafuku’s last ride, the Eagles rallied behind their coach to cap off an undefeated 2017 season with a title win over the Tiyan Titans. #9 – Travis Taijeron gets the call to Majors: The major league dreams of Chamorro blooded Travis Taijeron was fulfilled this MLB season as he got called up to join the New York Mets! Taijeron spent six years in the minors before taking up a spot in the outfield for New York. Travis is a descendent of Vincent Taijeron from Malesso. #10 – Royals win 2017 volleyball title: The ND Royals had been waiting 21 years for a volleyball title and 2017 was their year. Behind MVP Carlie ‘Hand Quake’ Quinata, the Royals displayed their versatility and good defense in the title game by defeating the St. John’s Knights in four sets. Royal fans over three decades, and some, were celebrating as ND made it’s way back on top the volleyball world.